Young rodeo cowboy Brady Jandreau begins this story with a terrible head injury. A bucking bronco has stomped on his head, causing life-altering injury. Brady recreates a time in a way of life. It's a quiet meditation on change, set in a stark South Dakota landscape played out in hospitals and trailer homes. 25 years ago, "8 Seconds" told the story of rodeo rider Lane Frost, but didn't quite get to the core of the life and sport that killed him. "The Rider" finds that depth. 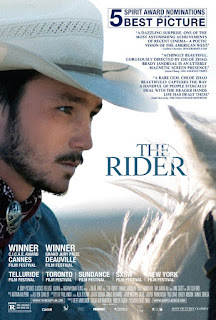 "The Rider," 3 stars, rated "R." Does it deliver what it promises? Slow but sure reality. Is it entertaining? Different from the usual. Is it worth the price of admission? This is art.